“You did not just give us water, you gave us life.” These words were spoken to Eric by an elder as they stood together at the dedication of one of our water projects. Perhaps no words have ever had such a profound effect on Eric. The land is fertile and the people capable farmers who are willing to work hard to raise crops. However almost all agriculture in Kenya is dependent upon the cycle of rain and the capacity to store water between the rainy seasons. The ability to raise food and become self-sufficient is directly connected to the ability to have water for crops. Providing a stable source of water – for drinking, to water livestock, to irrigate crops – is the very heart of prosperity. Giving food is often necessary to avoid starvation. 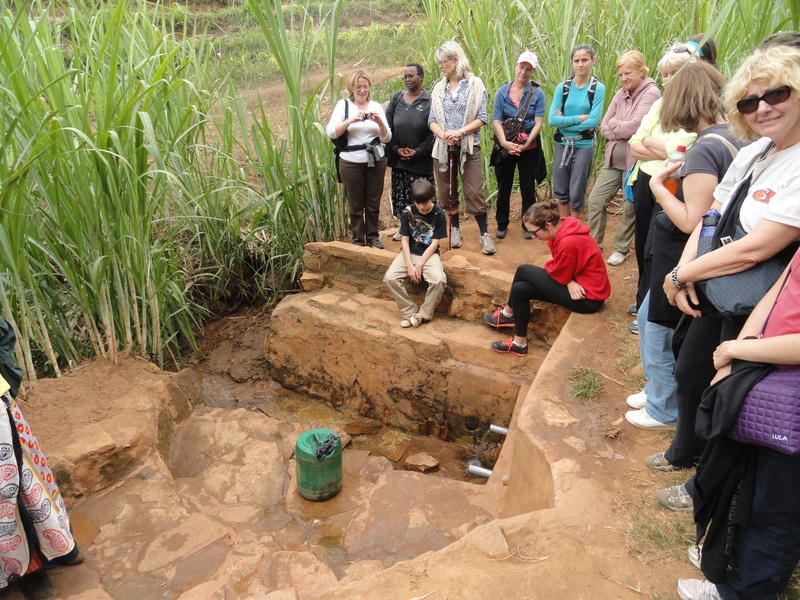 Giving water – along with tools – is the way to avoid the cycle of starvation from not arising as often or at all. 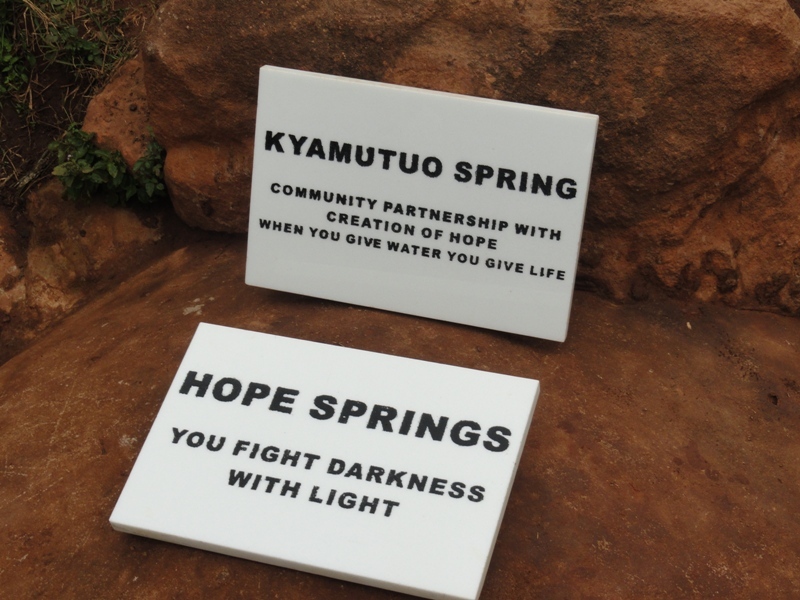 We work to form a partnership with communities to create water projects. We provide steel rods, cement, plumbing, pipes and valves and outside expertise, and the community provides sand, gravel and labour, all administered under a local committee. This partnership means that community members are not only invested in the project but are intimately involved with how to maintain the project. If there are problems that evolve – and there was a re-engineering that had to take place in the project below – they have the expertise and the ownership to fix it. 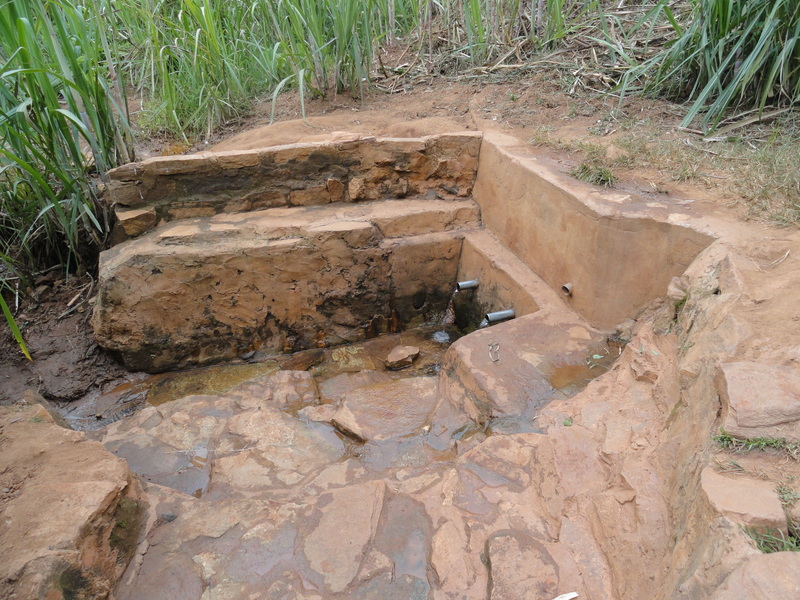 This project converted a trickle of water in the mud into a steady, stable source of water. 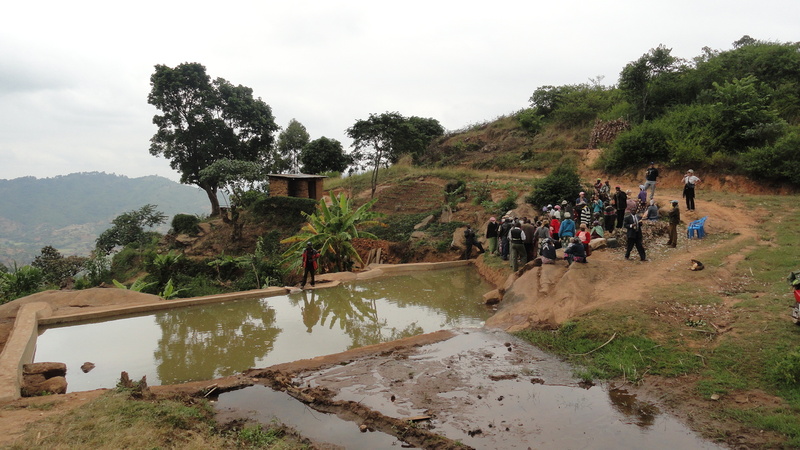 This community of 800 people has been able to more than double their crops, provide water for their livestock to produce more milk and meat, and a clean source of water for drinking and washing. The local committee determines the schedule for maintenance, repairs and the schedule under which the water is diverted from plot to plot for irrigation of crops. This was a small trickle of water in the mud. 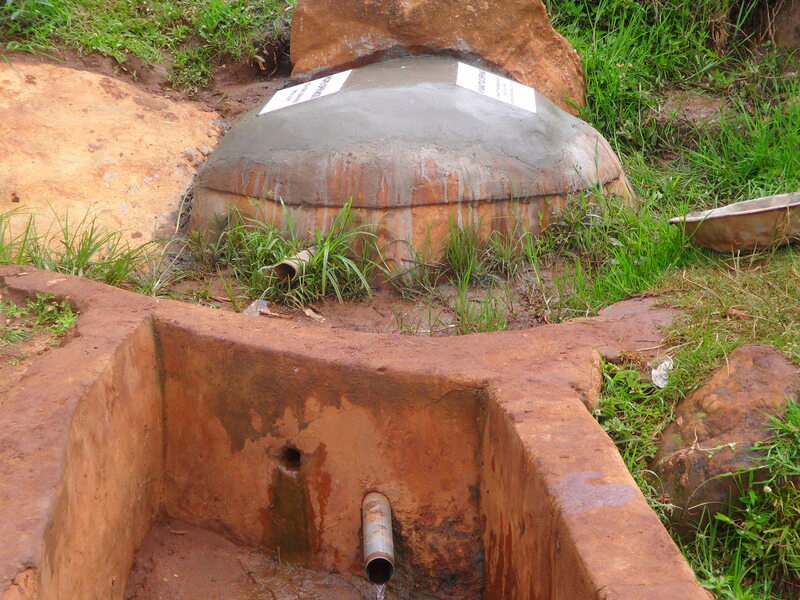 The water was tainted and the people drinking from this source – particularly the children and old people – were continually sick with water borne diseases, often hospitalized and dying. Mr. Kiio – our Project Manager – donated this piece of property to allow this to be built and it is now public property for use by all. Under an active committee partnership the trickle was harnessed, stored and is utilized. 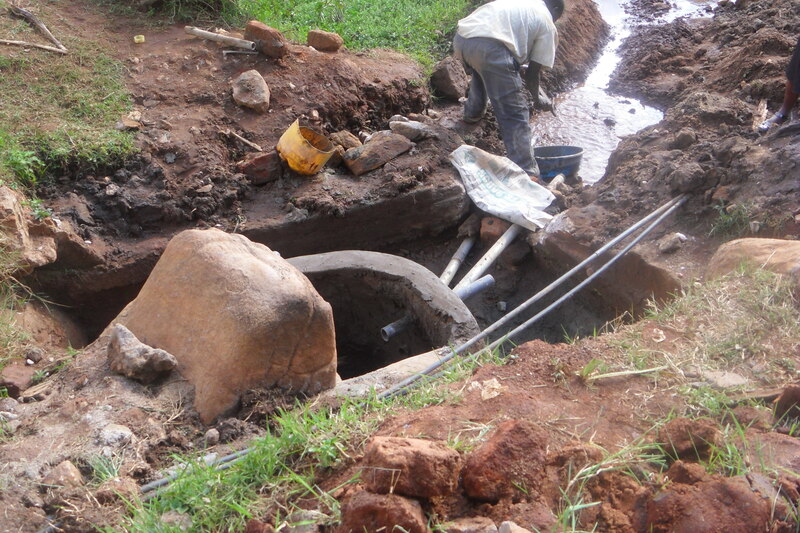 Since this project has been in existence – almost 3 years now – there has not been one case of water borne disease! 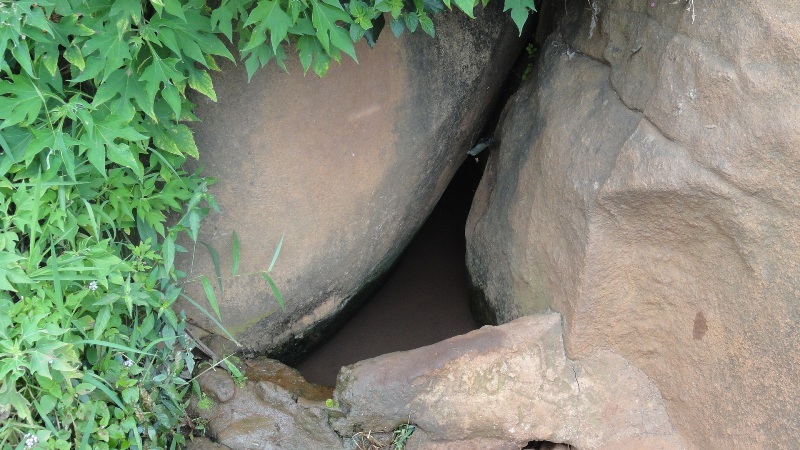 This little trickle of water that pooled in this depression – about the size of a dinner plate – was the water source for almost 700 people. 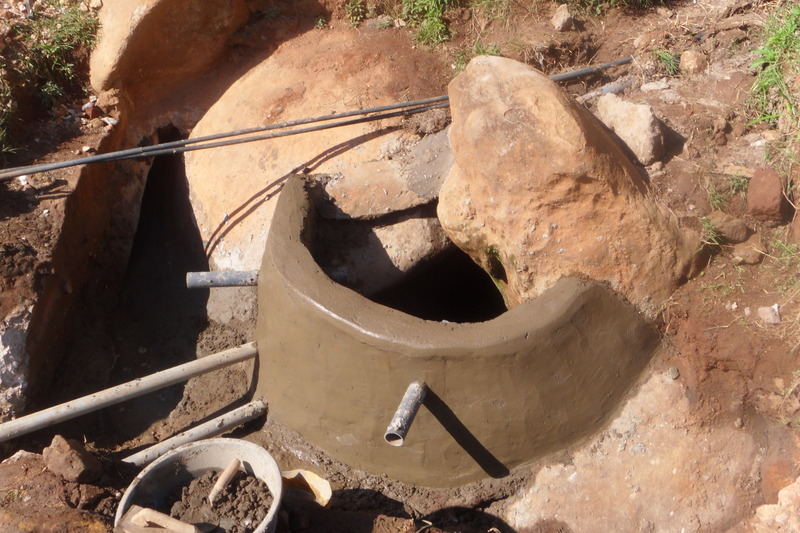 Water would be scooped out with a ladle to fill water containers – a task that could take up to ten minutes. During the dry seasons the line-up could be 20 containers deep. The water was muddy and contaminated. At night the trickle would continue but simply disappear into the mud, unutilized. We partnered with the people in the community to build this project. And were fortunate enough to be there in the summer of 2013 when it was officially opened. There is also a storage pool where water accumulates all night and then is ‘unplugged’ each morning to allow plots to be irrigated each day. 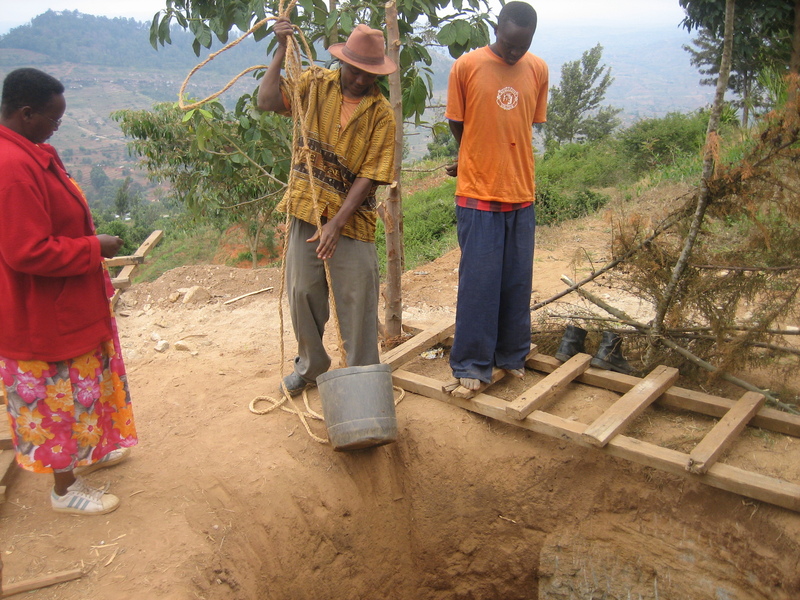 With the growing population in the Rolling Hills Residence we required far more water than could be stored from harvesting rain during the rainy seasons. 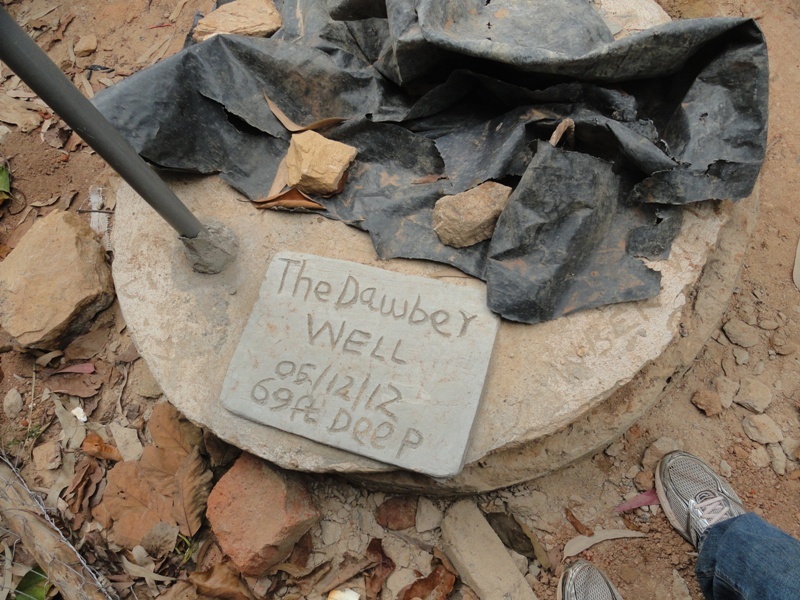 We started digging a well. 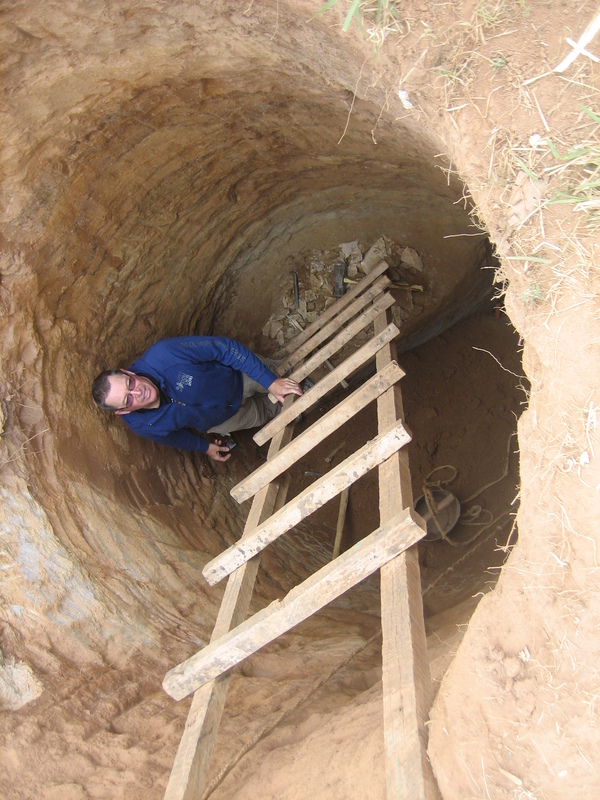 Through a combination of digging, chipping through solid rock, and dynamite, the well went down 72 feet. It now provides clean, fresh, plentiful water that supplies all of the needs for all the residents of Rolling Hills Residence, as well as irrigation for the farm. 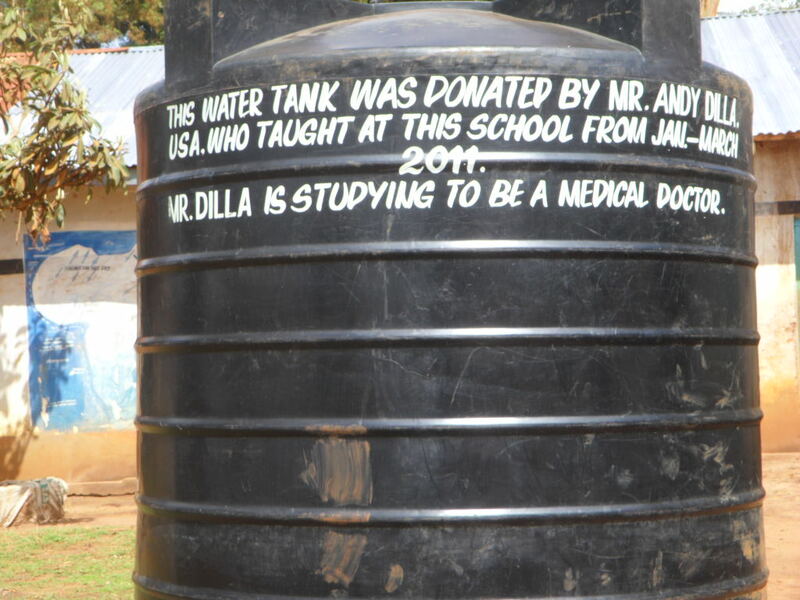 This is a very giving well and the water tanks are now always full. 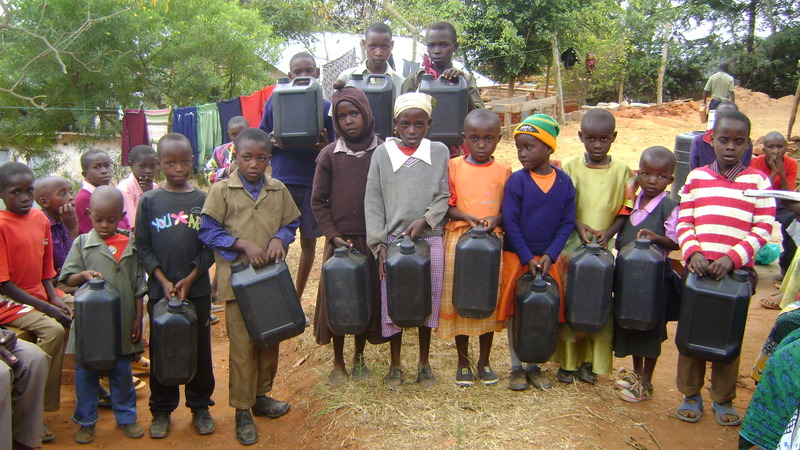 Putting water containers in the hands of children in the community. 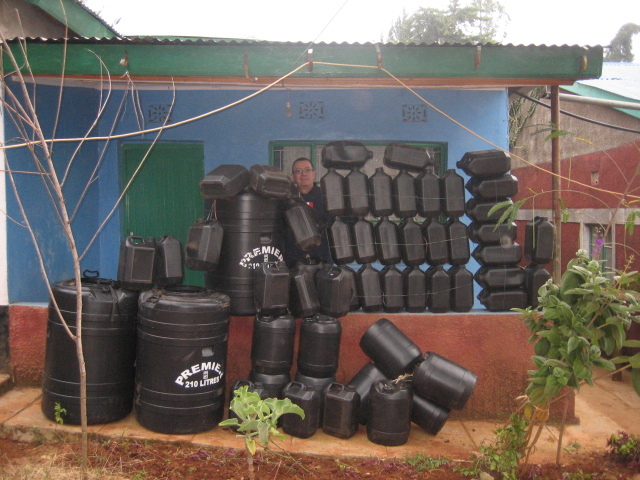 Large storage containers donated by Andy Dilla – who was a volunteer in the community for two months. This is a popular way to contribute to the Creation of Hope. 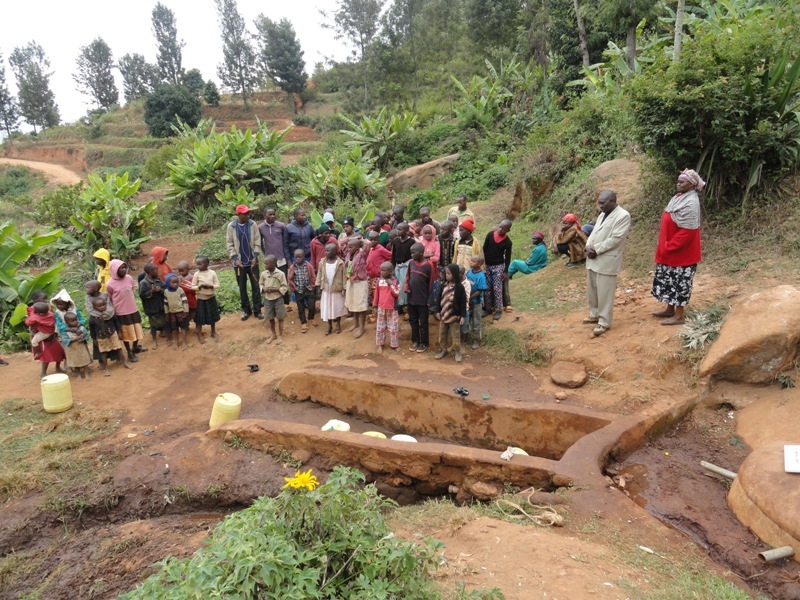 Please visit the “How to Donate – What Your Money Can Do” tab to find out how you can contribute funds to water projects.